Machine learning is a key part of how big data brings operational intelligence into our organizations. But while machine learning algorithms are fascinating, the science gets complex very quickly. We can’t all be data scientists, but IT professionals need to learn about how our machines are learning. The basic premise of machine learning is to train an algorithm to predict an output value within some probabilistic bounds when it is given specific input data. Keep in mind that machine learning techniques today are inductive, not deductive — it leads to probabilistic correlations, not definitive conclusions. 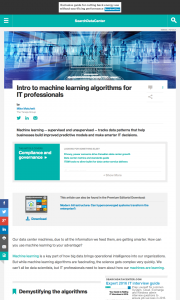 This entry was posted in Published Articles and tagged data science, Machine Learning, Modern Infrastructure magazine, predictive modeling, SearchDataCenter, Taneja Group by Mike. Bookmark the permalink.